The Panasonic disks were available in with capacities 200MB single sided,200MB 940MB 1.4GB 1GB 1.5GB, and were available as WORM (Write Once Optical Disk Cartridge) , ReWritable, Double Sided with data size 470MB/Side, 500MB/Side 700MB/Side 750MB/Side. By far the most common disk we see is the LMD501W and LMW1400A and LMR1500A. We sometimes get the LMD702W,LMD702 and the rare and hard to read LM-D500 which was often used with Corel Backup Software to create a DOS like partition in Novell Windows computers early Apple Mac G3 G4 PowerPC PPC computers. The disks are compatible with Plasmon’s RF Reflection Series disk library and jukeboxes and Panasonic’s LF series Phase Change drive jukebox. 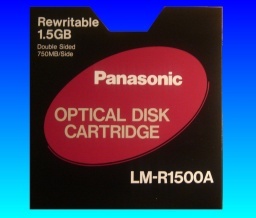 The disks were re-badged and used in Magstore, Storage Dimensions, Corel PRO Drive, MAXIMUM Duetie, Bio-Logic, Reflection Systems and IBM 3363 WORM	Write Once Optical Disk Cartridge system. Panasonic also sold the LF-J5000 disk library jukebox which could store up to 50 discs with interface to Mac, Vax VMS, Unix, Xenix, and Micro Channel and Plasmon had their RF Reflection Jukebox. 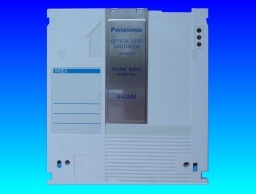 Panasonic disks were used in Apple Mac and Windows / DOS PC, as well as proprietary systems like the Panasonic KV-F510 Electronic Filing System. 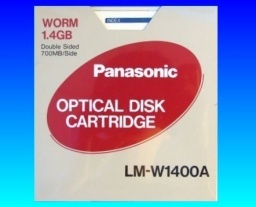 The 5-1/4 inch WORM media have a data retention of only around 10 years so it is probably best to get the data off them before the discs start to deteriorate and show errors or give trouble reading in the drive. 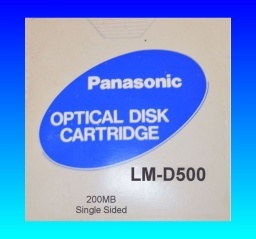 Panasonic first demonstrated the LF-5000 drive connected to an Apple Macintosh computer in 1987, and it was available to the public in 1988. The data transfer rate was 2.5MB/second Its file copying / restore took about 25% longer than its file backup / writing. The unit has standard computer SCSI connections, and they did offer an LF-5001 without SCSI. Price was forecast to be around $2500 - and that was for a drive capable of reading 200MB disks. Later actual list prices were around $3800 - so a nice bit of inflation there! The WORM filesystem used Corel software and had signatures like IBM CRL2 CRL3 and CPK. Its main use was envisaged as hard disk backup, desktop publishing applications, and graphic imaging software. Apparently Corel SCSI allowed interface to Novell and OS/2 along with DOS. 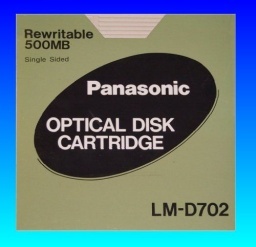 The disks could be read in Panasonic optical disk Jukebox LF-J5000 and Plasmon RF-60J-703 Optical Jukebox (which could hold 60 disks and used Matsushita LF-7394P Drives / 5.25 1.5 GB). 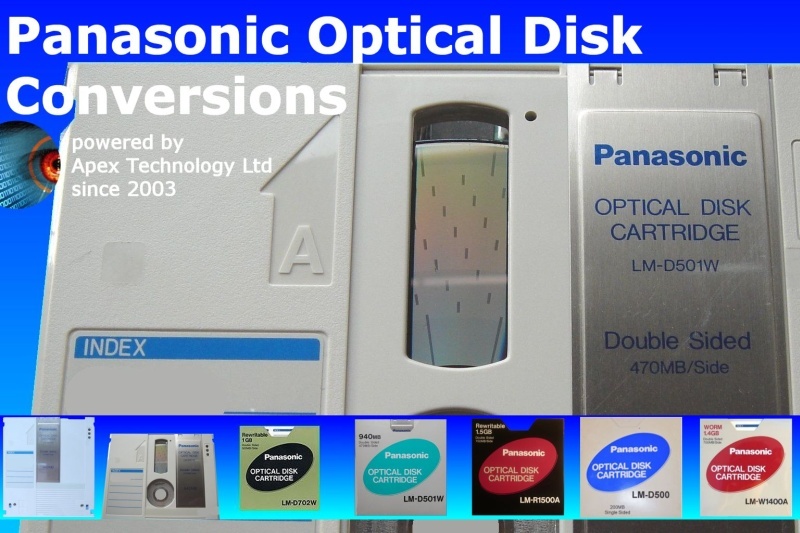 Panasonic Optical Disk Conversions, File Transfer and Data Recovery problems that we recover data from are listed below. 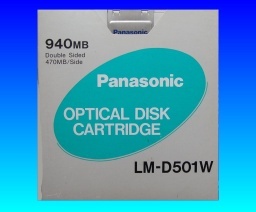 Panasonic Optical Disks Convert Transfer Files Data Recovery WORM,LM-D500,LM-D500W,LM-D501,LM-D501W,LM-D702W,LM-R1400A,LM-W1400A,LM-R1500A,ReWritable,Write Once.